Malaria is a disease caused by parasites that are carried by mosquitoes. Once in the bloodstream, the parasite inhabits the red blood cell (RBC). 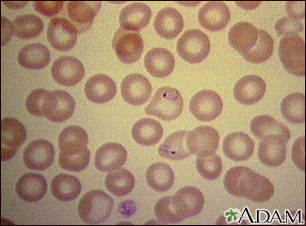 This picture shows purple-stained malaria parasites inside red blood cells.